While trader attentions have been focused on more conventional risk indicators like equities, yields and bonds spreads in the aftermath of the February VIX eruption, a less followed - if perhaps far more informative indicator - the USD Libor-OIS spread has been blowing up, widening to 32.7bp - the most since last Feb. 22 - as Libor sets higher for the 11th straight session, while commercial paper rates for financials are also rising as more issuers have been selling longer-dated obligations, and moving closer on the curve. So is there another dollar shortage quietly forming behind the scenes? As it turns out, the answer may be yes, and the culprit is the same "echo taper" discussed here last year (and recently by Credit Suisse's Zoltan Pozsar) , when we commented on the impact repatriation would have on rates, and especially the front-end. 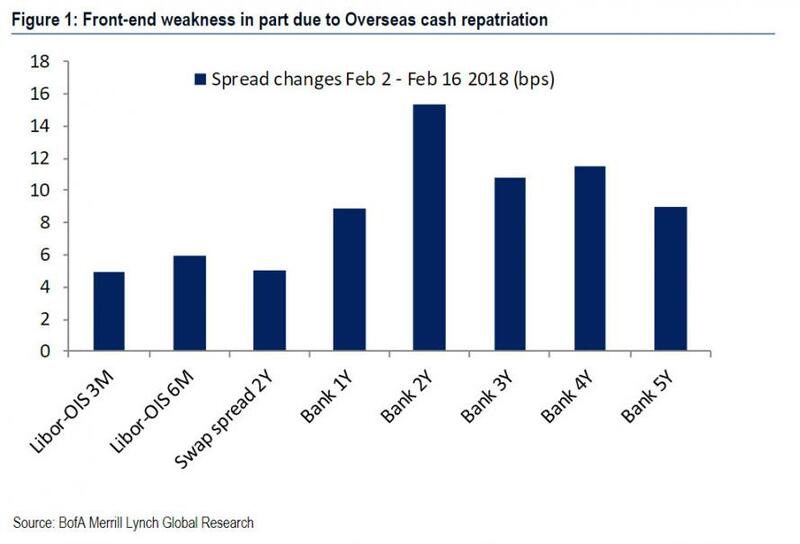 Overnight, Bank of America reminds us that one of the biggest stories of 2018 for high grade credit is overseas cash repatriation as part of tax reform. It is such a simple - yet powerful - story. During the ongoing 4Q earnings season we have now heard from most of the largest holders of overseas cash. Although specific plans are obviously "work in progress" some clear patterns have emerged. Among the most notable "pattern" is that a big decline in debt issuance volumes is implicit throughout - for example in AAPL's decision to bring their $163 billion net cash position to zero, and in some cases explicit like JNJ's statement that "we'll no longer need to borrow for US purposes". This makes intuitive sense: after all, until the passage of the repatriation holiday, company had to issue bonds domestically to fund dividends and buybacks (ostensibly collateralized by net offshore cash). That will no longer be required as company can simply use offshore cash brought back to the US to engage in shareholder friendly actions. Another aspect of the corporate "echo taper", is that a number of companies plan to also pay down debt including KO, which said this week that "the company plans to reduce its gross debt by approximately $7bn with cash currently held overseas" and AMGN's statement that "we could find it prudent to pay some upcoming debt maturities in cash rather than refinancing in the market". Here BofA adds that one thing not announced -yet - is companies announcing plans to tender for existing bonds, although that could still be consistent with management guidance in many cases such as KO and AAPL. The big implication here is that as hundreds of billions in offshore cash return to US soil, corporate America is set for a significant round of gross (if not net) deleveraging amid rising rates and growing interest expense. There is another major aspect of overseas cash repatriation, and it has to do directly with the abovementioned blow-out in the Libor OIS as financial markets are now losing one of the biggest providers of funding in the front-end. This is certainly the case in the corporate bond market, but also the commercial paper market, money market funds, CDs, securitized products and other fixed income asset classes. This was explained last October in "Why US Tax Reform Will Put Even More Pressure On Dollar Funding Markets." As BofA's Hans Mikkelsen writes, "it is impossible to overestimate the importance of this story and we are seeing the effects already in a number of ways." 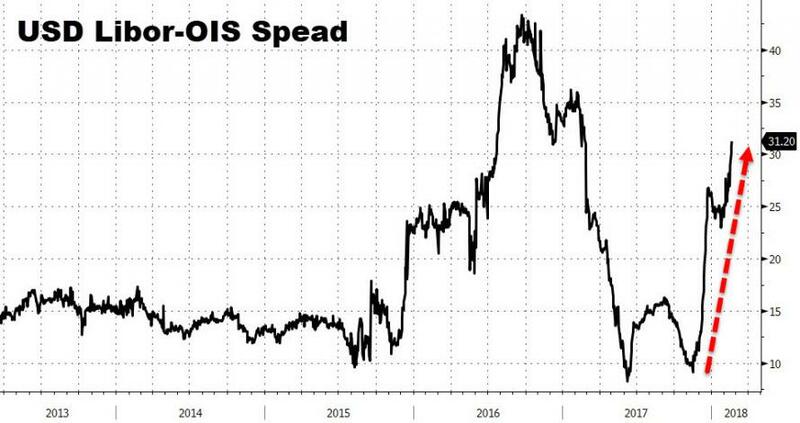 With the Libor-OIS spread about 10bps tight of its recent record wides, we expect even wider front-end spreads as funding, and liquidity, fade. What happens once the Libor-OIS hits the 40bps range remains to be seen, however traditionally when front-end funding metrics have been that stressed, something has usually snapped, first in the unsecured rate market, and from there, all other risk assets. It will be painfully ironic if Trump tax reform, seen by virtually everyone as a slam dunk for higher stock prices as a result of the hundreds of billions in stock buybacks it enables, ends up being just the catalyst that breaks the market by soaking up most if not all of that so very critical front-end monetary lubrication.